We try to cut cost by buying all components together. Phase 1 is prototyping (actually this post). We design 3 (might be 2 or 4) main designs. For these base designs you get everything ready and pre-configured. You get the teensy already programmed with the proper firmware, the right number of diodes, a CNC'd PCB and so on. All you need to do is to solder the switches. Consider it a sort of keyboard construction kit. I might be available at assembling the keyboard for you, but the service won't be the cheapest (sorry guys). If you don't like any of the main designs you can send me a CAD file and I'll have it laser cut with the others. You can still get the teensy and the other components if you want. Realistically the GB will start in a couple of months. 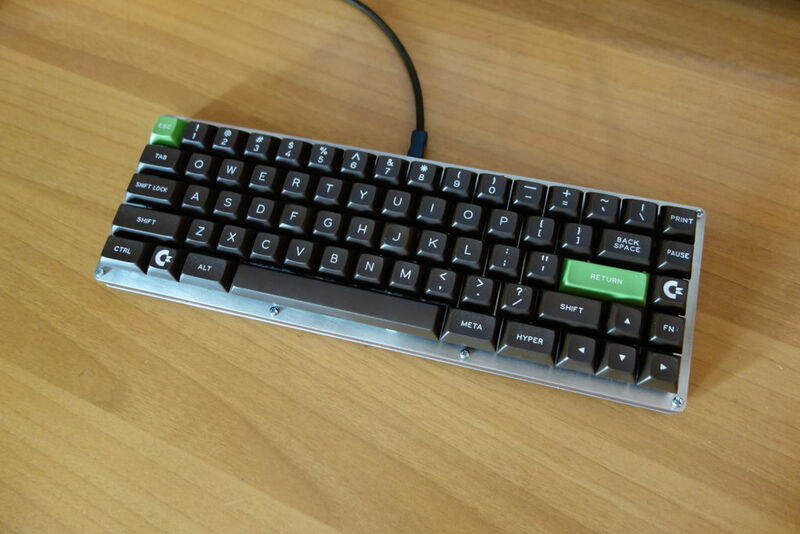 A hand-wired custom keyboard goes between 150 and 200 euros. We hope to cut that price a bit, but consider that this time we will try to use a PCB, so we will have that to add to the expenses. Of course you can still hand-wire your keyboard if you want. The 3 official layouts will be cheaper than the custom ones. The material for the layered keyboard will be most likely plain stainless steel. You can have your custom layout but you cannot choose the material! The material will be the same for all. This is done to reduce expenses with the laser cut and headache to myself. If there's not enough interest I won't proceed with the GB and maybe I'll just have a few boards laser cut for a couple of friends. a plain old 65%. note the backspace position. - I'm not going to use insanely (too small, too big) sized spacebars (just because they hard to find). this is of course true for the "official layouts", if you design your own, you can do whatever you want. - ISO vs ANSI. Fight! Last edited by matt3o on 27 Nov 2015, 11:31, edited 2 times in total. I have a cut down µTKL design I'm working on, that I can share. Top features: No function row, HHKB Fn key and Backspace, compatible with Round 5 and Matt's DSA sets, and a strictly minimalist case. You've all seen my Shiny 60%, you know the kind of thing I'm going for. I'm also exploring a second design using those small space bars available in Round 5. Or even a Matias switch build, if Matteo's confident enough to try. Please share your layouts, Murium. I've some diagramming to do then! I'll do a symmetric version too, ماء, as I'd like to see if it's possible with Round 5 caps. But standard stagger is what I have in mind, really. I think symmetric stagger would be a better idea for a fully split keyboard, for me at least. Muirium wrote: I've some diagramming to do then! I'll do a symmetric version too, ماء, as I'd like to see if it's possible with Round 5 caps. But standard stagger is what I have in mind, really. I think symmetric stagger would be a better idea for a fully split keyboard, for me at least. I think symmetric stagger good on a regular keyboard rather than split, split to columnar although I prefer for symm sgg for now. Last edited by ماء on 17 Feb 2014, 17:31, edited 1 time in total. I vote for an ISO Choc Mini Layout! Audacious! My steel 60% from last year weighs a kilo, naked. It's 15x5 units. Your design is 36% larger even without gaps, so it would be one impressive piece of steel. Only the plates would have to be different. But I'd be fine with dropping the two rightmost columns, as long as the F-row is in there, I am happy! Last edited by rindorbrot on 17 Feb 2014, 17:33, edited 1 time in total. rindorbrot wrote: I vote for an ISO Choc Mini Layout! I kinda like it actually. not sure about the Function row, but one could always put them on the FN layer too. it would be technically feasible to support both on the same plate, but it doesn't look good on a naked board, imho. I like the layouts, but I think that the non-standard HHKB-style backspaces will make caps particularly difficult to source and I'm not sure about the compromise here. Of course there's always round 5, like you suggest, but it still rules out using most other keycap sources without going all blank. matt3o wrote: I kinda like it actually. not sure about the Function row, but one could always put them on the FN layer too. But that is exactly the point, I want the F-row and Numbers on the first layer. scottc wrote: I like the layouts, but I think that the non-standard HHKB-style backspaces will make caps particularly difficult to source and I'm not sure about the compromise here. Of course there's always round 5, like you suggest, but it still rules out using most other keycap sources without going all blank. I tend to agree. We should try to keep it as standard as possible... but I don't know if it is worth doing a poker/whatever clone. I have high hopes for the forthcoming dyesub PBT "beige" DSA set, as I expect it'll actually be a smart pair of monochrome greys. But you're quite right of course: HHKB backspace and short shift aren't for everyone. I'll see what I can do with my µTKL: the minimalist's choice. DSA is the way to go for custom keyboard, guys! NO ROWS! now go get that Skull Squadron keyset! But it is not available in ISO DE! cause I love vintage cherry keycaps and 1.5mods. And this would give me the ability to nearly use the complete and original caps that came of a g80-3000had/sad/... except right shift. Or complete keys of 1800had/... So if I have worn out a set of them, I can hunt a new set on ebay and don't have to use any special keys. I don't like keyboards with a lot of modifiers in bottom row (especially 1xmods), they always confuse me and I don't need them. I like it simple and classic. 1.5-1.5-7-1.5-1.5 is perfect for me. But that's a personal preference. I know other people love to have as many modifiers as possible. Indeed. I'm the opposite (I envy Japanese keyboards with their tiny space bars and extra mods) but keyset reuse is vital, and everyone's got their own preference. I have Alps / Matias ideas for some great old caps which take me out of my traditional comfort zone, but maybe not this GB! snoopy wrote: I don't like keyboards with a lot of modifiers in bottom row (especially 1xmods), they always confuse me and I don't need them. I like it simple and classic. 1.5-1.5-7-1.5-1.5 is perfect for me. But that's a personal preference. I know other people love to have as many modifiers as possible. This is where we differ! Hasu's firmware revived my Kishsaver yesterday, which was awesome. But his keymap had right shift set to the Fn key, to access the HHKB layer. It was driving me nuts! I press right shift just as often as left. Same with the thumb mods, especially Command on either side of the space bar. I use right shift a lot actually. I was talking about first row mods. any someone use SpaceShift dual role i went try,may alternative.. I'd say either capslock, right "super" or the lowest Anykey. Plus I'd also make the second Anykey a FN with an MXLOCK (maybe). So close to my dreamboard. I'm thinking of a solid wall of keys again. Note the navigation six-pack above the cursor keys: it's a square of 9. Because it's a numpad on the function layer, and 3 macro keys on the default. Re: Matt's number-row-less layout; I was wondering when you'd go 4 row! I have considered it for the TKL. But then I'd lose row 1, and it's my favourite profile of Round 5 caps.